Road Wolf is about working hard, playing hard. and looking good doing it! Confident, genuine, & always trustworthy, it celebrates the independence, freedom and longing for adventure found in every human spirit. Road Wolf is the story of a pioneer brand, carving its own path in order to make fine craftsmanship available to all who deserve it. Cultured Cowboy is proud to present Road Wolf. Road Wolf is sure to become a favorite of hardworking, free spirits everywhere. And, since the collection offers men, women and children’s options, no one gets left out. Of course, quality materials and fine craftsmanship also add to this new brand’s appeal. Many Road Wolf boots boast authentic leather outsoles — not usually seen in this price range — and come in a variety of new heal and toe choices. Add additional elements like the Wolf Pads™ comfort system, Wolf Shield™ waterproofing system, and a range of fresh, exciting upper patterns, and it’s easy to see that Road Wolf is off to a good start. Using premium materials from all corners of the world, Road Wolf Boot Company offers high-quality footwear at a price point that buyers and sellers alike can appreciate. Consumers get authentic, finely crafted shoes at a reasonable price. Built by skilled craftsmen in China with over 10 years experience producing product for the United States, Road Wolf Boots represent a blend of carefully honed skills and time-honored techniques like Goodyear Welt Construction and hand-stained finishing. Our best selling Road Wolf men's boot styles are footwear that can crossover from a Motorcycle Boot to Casual Boots, to Western Boots. 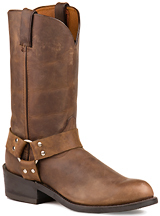 Desperado Slouch Top Boots are soft on the ankles and the oil pull-up leathers make a boot that is very weather resistant. 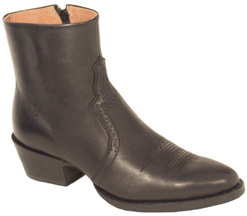 Road Wolf Slouch Boots are very similar to the Durango slouch boots of twenty years ago. The sole appears to look like leather, but is actually a "tire rubber" compound that holds your traction without being aggressively "sticky". Vegas is an even softer crunch leather with the same properties as the Desperado. 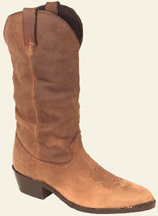 All three styles come with tips on the medium round toe, and a cowboy underslung walking heel. 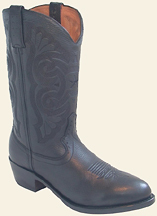 These men's boots are some of the most popular Half Boots made. For many years, all companies had a side zip boot. I have no idea why they are so hard to find now. 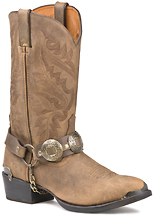 This Western style boot is great for people with wide feet, large calves, ankles that do not rotate as easily as they used to do, and/or feet that swell easily. Road wolf has split the difference between production and hand-made. This gives you a reliable, comfy boot at a reasonable cost. 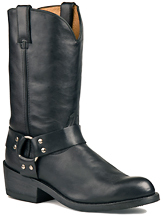 With these popular men's harness boots you make a fashion statement. Snoot toe (square toe) gives plenty of toe room. The harness has just a touch of raised center for interest. Ride your Harley, or take a stroll. These retro 70's harness boots will perform for you. Traditional 11 inch top version. The medium height top will keep stuff out of your socks better, and still fit most all calves! Great fit and feel. Ditto the Medium Round toe "92" version. 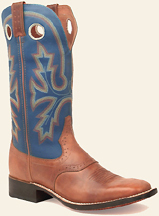 Cowboy Tough Value Priced Western boots. Saddle vamps across the bridge of your feet. Spur ridge on the heel rand. Heavy counters to keep the heels in shape. Pull holes, oil pull-up leathers & more, to make your Buckaroo experience a good one. 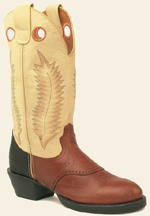 The Stockman boots have quality features in a lower heel, broad squared toe roper style boot. 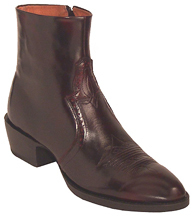 Sometimes called horseman's boots. This styling has made it's way from TX & OK to both coasts. Road Wolf Work Boots - Coming Soon! Road Wolf Women's Boots - Coming Next! NOTE: Because there are only so many hours in a day, we are launching these Road Wolf pages before finishing them. Ladies boots with all the guts of men's boots, and the exquisite feminine features you expect from Road Wolf boots. At this time, Road Wolf is closing out their kids selections. Very few left. Let's hope for better children's boot shipping this Fall. Cultured Cowboy will gladly refer you to the Cultured Cowboy Boot Index to see our selections of other branded child's boots. 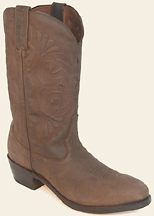 Just a few sizes left in this great copy of one of our best selling adult boots.